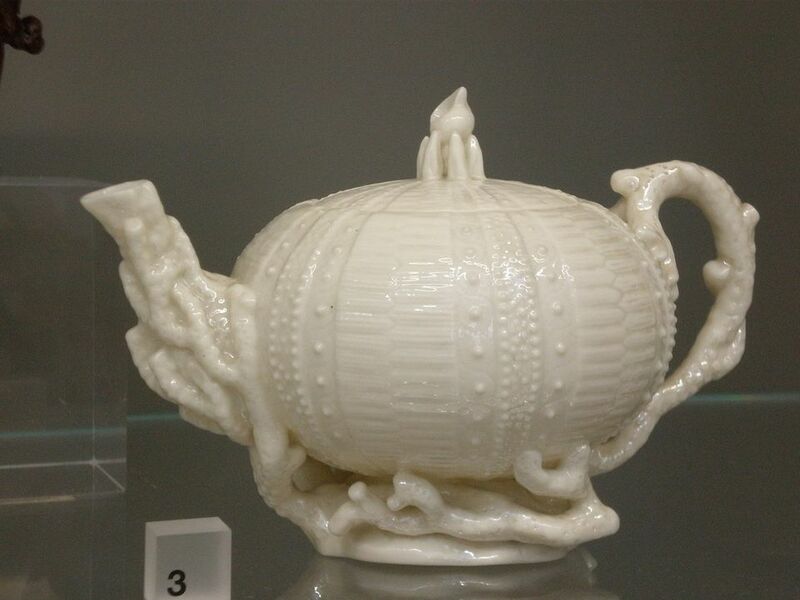 Belleek Pottery, glazed porcelain, slip-cast Ireland, Co. Fermanagh 1869-82. Belleek originated in Ireland in 1857 and remained in production there until World War I when it was discontinued for a time. Like many manufacturers of ceramics such as the Fulper and Alamo potteries, Belleek started out making utilitarian earthenware such as hospital fixtures, floor tiles, and telephone insulators along with items for household use. By 1863, after a number of failed attempts making fine porcelain, the factory was finally producing Belleek Parian China when recruiting several skilled artisans to get the new lines up and running proved to be fruitful. Belleek china has a unique look that is easy to spot. It is a very thin porcelain and ivory in color although it may have colored accents. When held to the light, it has a somewhat translucent appearance that can be mistaken for milk glass by novice collectors. The distinctively Irish "Shamrock" pattern is definitely the most familiar with antiquers but many other styles were made by this Irish company as well. After the slow down during World War I and a huge dip in demand, the Belleek factory was sold in 1920 with the stipulation that it must keep producing pottery. Belleek Pottery Limited was born, and the plant was modernized. World War II later brought a new set of challenges, though, and the factory returned to making more economical earthenware to stay afloat although production was once again low and exports nonexistent during this period. As with so many goods, the demand for Belleek increased drastically in the late 1940s post-World War II era moving into the ‘50s. By 1952 the company employed 240 people and they were using more efficient electric kilns instead of the old-fashioned coal fired equipment previously utilized. Business was good through the early 1980s when the Northern Ireland Industrial Development Board provided further modernization of the facility and restored “firm financial footing” by purchasing Belleek. They also formed the Collectors Society during this period to bolster demand, as shared on AboutBelleek.com. The company changed hands again in 1988 when Powerscreen International took over. They added a restaurant, museum and visitor’s center which reportedly attracts more than 70,000 visitors each year. In 1990, George Moore became the new owner of Belleek, and the factory is still in business today making fine china in the Belleek tradition. Several American firms made a Belleek-type porcelain to capitalize on its success without having to import the wares, according to Warman’s Antiques & Collectibles 47th Edition edited by Noah Fleisher. The first was Ott and Brewer Company of Trenton, New Jersey in 1884. That introduction was followed by lines made by The Ceramic Art Company in 1889, American Art China Works in 1892, Columbian Art company in 1893, and Lenox Inc. in 1904. The more modern Lenox versions are the most readily found today since they were made over many decades. These pieces are sometimes referenced by collectors simply as “Belleek” because of the similarity in the look, even though they were not made in the original Belleek factory in Ireland. The marks on Irish Belleek help tremendously with dating, since each variation was used during a specific period of time. It is, however, important to look at details like the color along with the symbols unique to Ireland and the wording used in the marks to avoid dating your piece as too old or too new. Belleek.com offers a complete overview of the company’s marks, including the variations in color, and information on when they were used. And remember, if an item is not marked as such, it is not true Belleek but one of the many copycats that are collectible antiques now in their own right.